Booking online is safe and easy. No banking details will be asked for. A deposit payment will be due only once the booking has been confirmed. 5. The arrival date, departure date and cost of your booking is displayed. To book a Short Break, click the 'Booking a Short Break' above to read the policy on flexible Breaks and check for any Additional Information at the bottom of this page. Then proceed as above. On some calendars, weeks in which Short Breaks are accepted are denoted by 'SB'. Select your week and the Short Break can be chosen on the next page. We accept Short Break Bookings during the low season from Autumn to Easter. These weeks are marked below with SB (Short Break accepted). Short Breaks must either begin or end the week. Should the preceding day or leaving day not be booked by arrival/departure, you may arrive after 12pm or depart by 4pm. To book a Short Break, mark the relevant week, fill out the details and press the continue button. On the next page click the Short Break box and select the start date and the number of nights wanted. The new price will then be displayed. Fill out your personal details and submit your booking. Booking from Saturday to Saturday. Accommodates up to 4 people and 2 pets. The option to select a short break (where available) is on the next page. Your attention is drawn to the following information before booking. You will have a fire laid for your arrival and a complimentary basket of logs for the woodburning stove. Additional logs may be purchased from the owner. 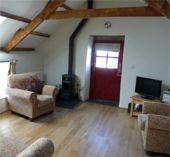 Two well behaved dogs are welcome in this cottage at a charge of �20 per dog per week or part week. Low season short breaks are available with charges varying according to the season. Flexible arrival & departure days may be arranged - please contact the owner to discuss requirements. Copyright © 2003 - 2019 just Booking Ltd.